“What really matters is what you like, not what you are like,” declares John Cusack’s “Rob” in High Fidelity. And indeed, the concept of one’s musical taste defining who they are is very much at the heart of this movie. Because of that, High Fidelity has become almost scripture for those who identify as music experts, and with its soundtrack bursting with indie pop, rock, folk, and psychedelia, this movie meets the challenge of scoring a story about music snobs with gusto. Curated like an old-school mix-tape, High Fidelity’s soundtrack includes some well-known favorites along with a selection of back-catalog deep-cuts. Cusack revealed that he and the film’s co-writers listened to over 2000 songs before narrowing the selection down to just 70 tunes. Although they don’t all appear in the soundtrack, there’s more than enough carefully curated material that did. In short, it was difficult to narrow down the top five uses of a song in High Fidelity but here they are. We can only hope Rob would approve. When setting the record straight on how to make the perfect mix-tape, Rob explains: “You gotta kick off with a killer, to grab attention.” The film’s soundtrack certainly follows this solid advice by throwing us into a song that manages to be both an underground curiosity yet somehow familiar-sounding. The 13th Floor Elevator’s “You’re Gonna Miss Me” features Roky Erickson’s lysergic shrieking against a woman who fails to appreciate him. This is psych-rock in its purest form, and with its bubbly electric jug sound and primal reverb guitar, it still sounds as innovative today as it did in 1966. This is exactly the kind of cut Rob would reach for as his relationship falls apart and the lyrics cleverly foreshadow what lies ahead. Nothing quite captures the sting of romanticized despair quite like a song by The Velvet Underground. So it’s only fitting this band, whose reputation is a bedrock upon which music snobbery is formed, appears twice in the High Fidelity soundtrack. One of these is the “Oh! Sweet Nuttin’,” a song about poor, disaffected street hustlers getting dumped out on the streets — used to score Rob’s woe-is-me reflections of his ex sleeping with a new man. The tune triggers empathy for Rob, despite his responsibilities. Clearly, there is nothing so petty or trivial that can’t be rendered gracefully meaningful by The Velvet Underground. 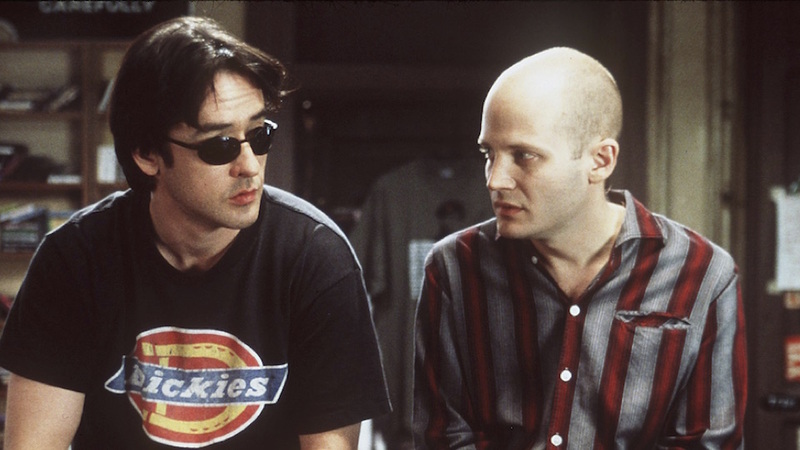 The focus of the music in Nick Hornby’s novel, the movie’s source material, is primarily American blues while the film offers a much-varied selection. However, the soundtrack does tap into some soulful energy in the form of this lesser-known Stevie Wonder track. Although the tune might whiff of adult-contemporary, its inclusion accurately underscores Rob’s reformation at the end of the film. Pictured sitting in an armchair making a mix-tape for Laura, Rob is demonstrating his evolution from selfish music snob to caring music curator. Surrendering to the music he deemed as “sentimental, tacky crap”, Rob is plunging into a more optimistic future, and in his own way, is finally committing to being open to love. Including a later-period cut by Bob Dylan on the soundtrack is a real record store clerk move, showing a commitment to an artist long after most fans have checked out. Dylan’s remorseful “Most of the Time” serves as musical exposition here, drawing connective lines between the lyrics and Rob’s inner world. It’s a transformational moment for Rob, and with Dylan’s lyrics “I don’t even notice she’s gone / Most of the Time” playing at almost equal volume to Rob’s to-camera confession, music and plotline become stirringly entwined. One of the more obscure tracks comes from The Beta Band, whose song “Dry the Rain” is played by Rob in the record store as he claims to be able to sell five copies of the band’s LP just by playing this song alone. The Scottish “folktronica” group’s tune laces together trip-hop with dobro slide guitar, beginning slowly, then surging almost subliminally into a pulsing, transfixing repetition. It’s the kind of song that can’t help but pull you into its mesmerizing narcotized groove, which Rob knows, as he meets a customer’s “hey this is good” with a cocky Han Solo-esque “I know.” Not only does the film thus depict the kind of Svengali power record clerks can hold over patrons, it also shows that fictional endorsement can work in real life. After the release of the High Fidelity soundtrack, the Beta Band sold a lot more than just five copies of their album The Three EPs, quadrupling their sales and becoming indelibly associated with this iconic movie.